With the right set up, a carport can do so much more that just protect our automobiles from the elements. 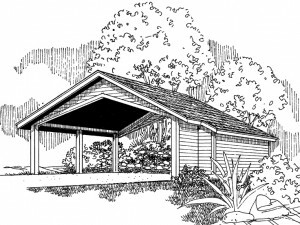 True, they are a nice storage place for the car, truck or other vehicle when not in use, but have you thought about what else a carport can store? If your carport has at least one solid wall, you can easily install storage cabinets on the wall at eye level or higher as not to interfere with the cars when parked inside. Wall cabinets provide an opportunity to organize and store clutter they we might otherwise leave on the ground where it can be tripped over, stepped on or even rolled over by the car. Arrange your wall cabinets in such a way that the items you store are handy, simple to find and easy to reach when you need them. They can be used for anything for tools and auto parts to gardening supplies and even used paint cans. Cabinets are available in a variety of materials including wood, metal and plastic. Installing cabinets in your carport increases functionality and optimizes the usefulness of the space.